Our reporting focuses on the environmental and social challenges that matter most to our key stakeholders. These include local communities, partners, governments, non-governmental organisations, customers, shareholders, investors, employees, media, academics, contractors and suppliers. Step 1: Identify and understand topics of significance to our stakeholders through a range of stakeholder engagements and reviews. Step 2: Identify topics of significance to Shell’s business strategy through our established internal processes. Step 3: Combine the results into a matrix and assess each topic in terms of its wider economic, environmental and social impact. Each topic is then assigned a weighting according to its significance in “sustainability context”. To determine “sustainability context” we review authoritative research and forecasts on environmental and social topics published by public institutions and governmental organisations. Step 4: We include all the highest priority topics in our report. 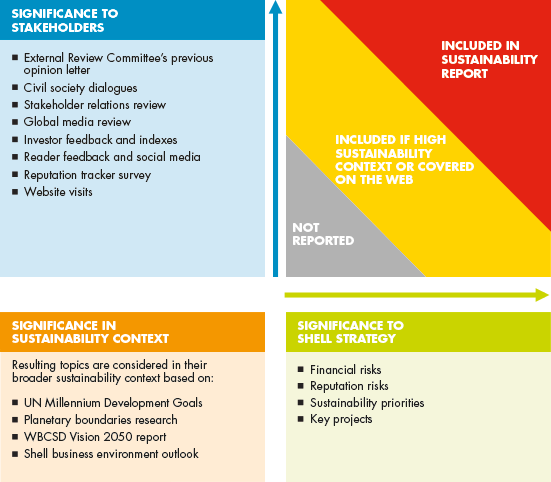 Those at the next level of importance are included if they have a higher weight in “sustainability context”; otherwise, they are covered on the Shell corporate website. Step 5: Our External Review Committee reviews the content selection to ensure that coverage is complete, relevant and balanced.